2013 Christmas Even dinner table. Over the years my grandmother taught me her secret Italian spaghetti gravy recipe (email me and I'll send you the recipe--seriously) and my mother taught me how to clean bathrooms. 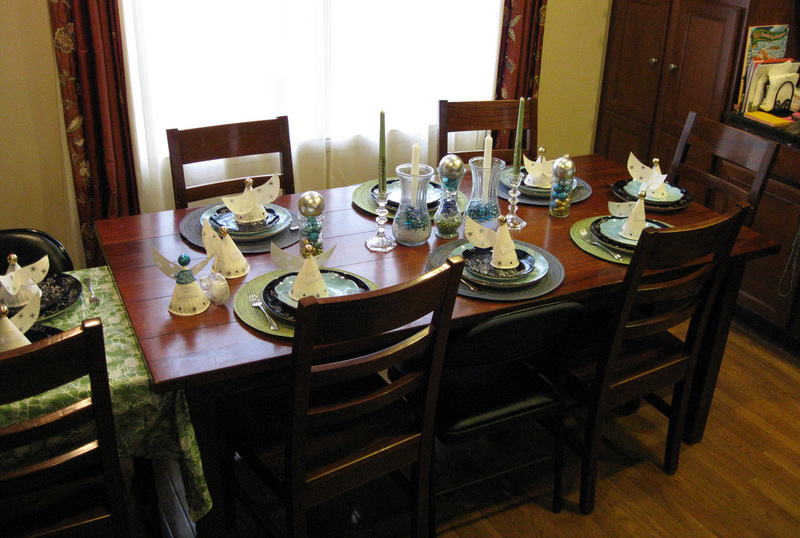 I learned how to a big dinner party for the holidays and keep the whole house clean. My grandmother and mother worked hard and took a lot of flak over the years from the men in my family but without them the house would have fallen apart. It's extremely simple. In growing up, the smell of garlic and onions was pretty much a common occurrence at my house. I have great memories making homemade pasta with my grandmother as well as chicken cutlets, red gravy and steaks. She also taught me how to set the table for big gatherings (napkin and fork on the left, knife on the right) and the flow of finishing courses in time for your guests. But what I remember most are the lessons she taught me about the Christmas Eve seven fishes dinner. When I was in college, I helped my Nan cook for the big Christmas Eve meal. We worked together and she taught me how to make the fish dishes as well as Agilo et Olio (pasta, garlic, oil and black pepper). We would work hard on getting the meal prepared and then she would sit down and only eat a tiny bit. On one of the last years that we made the meal together, I remember sitting down to dinner while everyone ate like pigs and I just ate a small bit. I looked over at my grandmother and then I realized. She was so tired from all the work that she had done each Christmas Eve night that she wasn't hungry. I had lost track on how many times she had sacrificed herself to help others and I made a commitment then that I would work hard on cooking for my family but making certain that both the men and women in my own family helped out. Only the women cleaned in my house. My grandfather and uncle might bring his plate into the kitchen after dinner but that was it. That's just how roles were back then. My mom taught me how to clean the bathroom when I was around 13 or so. And ever since then (even now as an adult), that's always been my chore. My grandmother and mother used to clean on a regular basis and, at first, I thought it was just to make certain that the house was in order, but that wasn't what was really going on. My mother used to clean (and rearrange furniture in the house) to loud music and dance around. The cleaning was a way of doing a chore, but also of getting the angst out of your life. I tried it a few times and it really stuck. Might sound crazy but cleaning quickly became an outlet for me. I will add here that my wife thinks I'm nuts and she does not agree with this at all, but it does work for me. I like being able to clean and have a means to deal with stress by just letting it all out. I don't scrub like crazy, but I enjoy singing along to cleaning. It's a great skill to help me keep organized in my life. My grandmother used to write extremely long notes in cards. She would write in cursive and I'd have a really difficult time understanding what she wrote. But her notes in the card always brought a smile to me and went something like this: "Dear Ronny, I am so proud of you. You are such a great boy and you have worked so hard to get where you are. I pray that God will watch over you and that you will continue to be happy ..."
Her notes were just a pure outpouring of how she truly felt about someone. She made a choice to be honest and to share what she was thinking with you. Everyone in the family would joke at her notes in the cards, but I liked how she took the time to write what she felt. She didn't care what anyone thought or said about it, but just would write from the heart. To this day, I prefer getting blank cards and writing something unique inside. I always think it's better to put something in my own words then what's in a Hallmark card. My grandmother would often grab my grandfather and give him a big hug and kiss. He would shy away, embarrassed, but my grandmother would not stop. She would also make up a tune and start dancing and kicking her legs like she was either on stage or strutting like a mummer in the Mummer's Parade. My mother picked up on this from her mother and she would put on The Rolling Stones, The Beatles or The Who and blast music. She would belt a song out like she was something else and I could hear her emotion, hurt and everything in between all coming out. I still do this and my kids think I'm nuts. But I like it. I like being able to identify with a song (that's the INFJ in me) and to just let my feelings out. To release them, feel drained and then admit that I don't know everything but all will be okay. But the most important thing that I learned came from my mom coming to talk to me about the birds and the bees. I don't recall most of the conversation, but what I do remember is her telling me that it didn't matter if I were straight, gay, believed one thing or another--none of that mattered. All that mattered is that she would always love me just for who I was. I would not be judged and put down for any of my beliefs. I was her son and she would always be proud of me. I have always taken that lesson to heart and have shared that with my own kids. Because, for me, it doesn't matter. What matters is that I simply be the best person I can be and when I make mistakes I can know that I will still be loved and then I'll get up, dust myself off and try again. My grandmother and mother taught me well and much of what I've learned I've included, in some form or another, in my Cinderella's Secret Diaries series. These are the lessons that I carry in my heart, teach to my kids and have written in my books. Yes, we were a crazy family, but I wouldn't have wanted it to be any other way.